The intersection of two key dimensions of how we think offers an interesting insight into the path from new idea to successful innovation. Alan Kay discusses them in a talk he gave last year at Demo 2014 called “The Future Doesn’t Have to Be Incremental.” It’s an excellent use of your time, if you’re prepared to think about what Alan is saying. Alan can be a deep and a dense thinker; he’s the kind of teacher where it might take days or weeks before the argument he is making hits you with its full force. This is our problem as the student; not Alan’s as teacher. Consider yourself warned as well as encouraged. The payoff is worth the effort. If you want to skip to the part of the video I want to examine today, go to the 18-minute mark. The first dimension he addresses is how we respond to new ideas or tools when they appear. Most of us (95% per Alan) respond to a new idea or tool in an instrumental way; we evaluate the idea in terms of how it might advance our current agenda. Our default response is WIIFM—what’s in it for me? One in twenty of us, however, asks a more generative question—should I revise my agenda based on this new idea? This difference in attitude is essential to invention. Another way to characterize this is whether someone reacts to a new idea in a closed or an open way. A closed response to a new idea treats the idea in terms of how it advances an existing agenda or goal, while an open response maps to Kay’s notion of reacting to a new idea in terms of how it might modify, reshape, or obsolete a current agenda. While WIIFM may be the question in either case, the shift in stance is important. The second dimension Alan explores is that of extraversion/introversion. I find it more helpful to think of this dimension as your compass; is it social or personal? Do you look to the group for your primary source of direction or do you look inwardly. Again, more than 80% of us take our cues from the group. We are, after all, social animals. 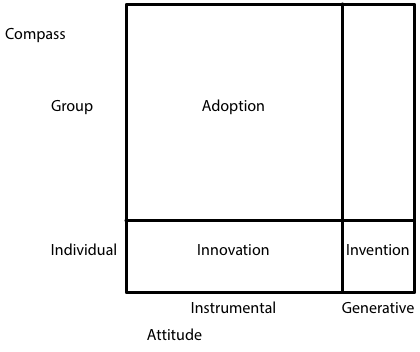 These dimensions aren’t completely orthogonal, but they do set up an interesting set of questions about invention and innovation. Work gets done by the grand majority of people who are tuned into the social matrix and see new ideas in terms of how they can advance existing agendas. At the opposite end of the diagonal, new ideas are generated by the few percent who don’t pay much attention to the social matrix and are on the prowl for truly new ideas. The challenge is that you need both groups to collaborate to generate big innovations. This collaboration is hard because the mindsets are so different from one another. The greater burden, I suspect, lies with the inventors (broadly writ). They are the ones who must walk their thinking back from what might be to what can be done now and set a path forward that avoids the temptations to settle for the incremental. This is a leadership task. And not simply a visionary exercise in painting the future in an attractive and compelling way. It depends on some ability to anticipate key forks in the path and to recognize the risks of alluring junctions that lead to the incremental rather than the transformative. Essentially the leadership task here is one of problem-finding and problem-framing; it is about directing the problem-solving capacities of the organization toward a future that is not simply a straight line projection of the present.